We’ve been hearing a lot about “super foods” of late, those purported to be high in certain vitamins and minerals, often with antioxidant properties. Among these “super foods” the sweet potatoes have found a niche, and with good reason. Sweet potatoes are incredibly high in vitamin A, are a great source of beta carotene and antioxidants. Even so, this “super food” has its share of growing problems such as yellow leaves on sweet potatoes. Read on to learn why sweet potato leaves turn yellow. This vining, herbaceous perennial, of the family Convolvulaceae, is usually grown as an annual and harvested at the end of its first growing season. The plant is cultivated for its delicious nutritious edible tubers, which may be red, brown, yellow, white or even purple in color. The spectacular vines are dotted with lobed, heart-shaped leaves that may reach up to 13 feet in length. Yellow sweet potato leaves may be caused by several factors. If you see that your sweet potato leaves are turning yellow, you need to identify the source and act immediately, lest the problem spreads to the entire garden. This is especially true if you suspect the yellow leaves on your sweet potatoes might be caused by an infection, usually a fungal infection. Wilt diseases – Sweet potatoes with yellow leaves might be the result of verticillium or fusarium, two of the most common sweet potato diseases. In either infection, the plant begins to yellow at the base and works its way up the plant. These fungal diseases can be spread by infected transplants. Practice excellent garden sanitation, crop rotation, use cut transplants rather than slips, and treat root seed with fungicide before planting. Black root – Black root is another fungal disease that stunts and wilts plants, yellows leaves, rots tubers and eventually kills off the plant. 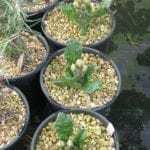 Unfortunately, if the plant is afflicted, the tubers, even if they look fine, will become increasingly affected by rot in storage. Use disease free seed, practice crop rotation (allow 3-4 years between sweet potato crops) and treat the seed with fungicide prior to planting. Alternaria – Alternaria leaf spot and leaf stem blight are fungal diseases that cause brown lesions on older leaves surrounded by a yellow halo. Stems and petioles become afflicted with large lesions that my result in defoliation of the plant. Again, plant disease resistant or tolerant seed that is certified disease free. Destroy all sweet potato detritus once harvesting is completed as well. Leaf and stem scab – Leaf and stem scab causes small brown lesions on the leaf veins, resulting in both curling and raised lesions with a purple-brown center. This disease is one of the most severe in areas of frequent fog, rain or dew. Water from the base of the plants, rotate crops, use disease free seed, destroy residual sweet potato crop detritus and apply fungicide to aid in control of the disease. Nutritional deficiencies may also contribute to sweet potato leaves turning yellow. The most common deficiency is lack of nitrogen, which can be treated with a nitrogen rich fertilizer. 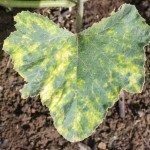 A magnesium deficiency will also show as yellowing leaves since magnesium is used by the plant to make chlorophyll. Use an all-around fertilizer to treat a magnesium deficiency. The best way to avoid yellowing leaves on sweet potatoes is to start them out correctly. 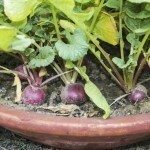 Use disease free seed tubers and amend the soil with compost. Water from the base of the plants to avoid spreading disease, and keep the area around the plants free from weeds and plant detritus. Rotate your sweet potato crops every 3-4 years, practice good garden sanitation, and immediately treat with the appropriate fungicide at the first signs of fungal infection.